Detail and depth of instruction. Lama Zopa Rinpoche’s teaching style emphasizes how to practice and making each moment deeply meaningful through bodhichitta and emptiness. Education in FPMT is rigorous and emphasizes regular meditation, retreat, and practice. Experiential lam-rim teaching methods and Kopan-style courses. * We encourage realization of the lam-rim teachings in the heart, not just intellectual study. Constant practice of merit accumulation and purification. These practices are emphasized as essential to bringing temporal happiness and preparing the mind for realization. Respect and support for ordained Sangha. 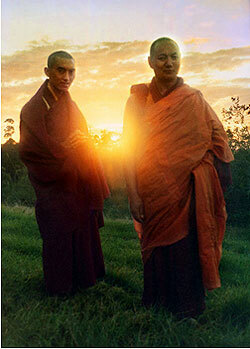 We consider ordained Sangha essential to the tradition. *Kopan Monastery, Nepal is the principal monastery of FPMT, where Lama Thubten Yeshe and Lama Zopa Rinpoche first began teaching in the early 1970s. The intensive Kopan November Course – first taught by these two lamas – combines experiential lam-rim instruction with meditation, and is held annually to this day.